Description: A look at drawing the eye from a frontal view using a step by step approach of observation and application of material. great video! my eye turned out perfect. so proud of myself! the only problem is i don’t have white charcoal. besides that its beautiful! Your courses are exceptional; the eBooks have a wealth of knowledge and are always well written and presented. Thank you! I have improved more in the few days that I have been taking these lessons than I did in a month of trying to relearn the drawing skills that I lost due to Traumatic Brain Injury. As Karonne said, “I am proud of myself.” Thank You. If you can teach these elderly brain damaged student, you can instruct anyone to become a proficient artist. Making my way through this course, slowly but surely. Pastel portraits call me, but I need these basics. Drawing the details, learning the shadowing & planes etc. I loved this lesson. Thank you so much! The modules that come later in the course do cover drawing eyes on a smaller scale. 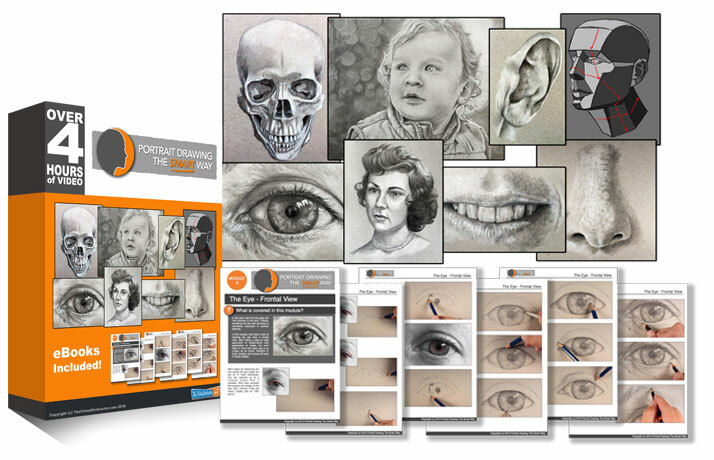 Look for the modules that cover the complete portrait drawing process.